David Willey has all that is needed to be part of England’s next generation. After their dismal showing at the World Cup - where elimination was confirmed by a humiliating loss to Bangladesh this week - there have been widespread calls for the national one-day side to be given an entirely new look. One of the names that keeps cropping up from pundits and former players alike is Willey’s. His father Peter played 26 Tests and the same number of one-day internationals for England. So having followed Dad’s footsteps by representing Northamptonshire, can Willey junior do the same by pulling on the three lions? His boss at county level certainly believes so. 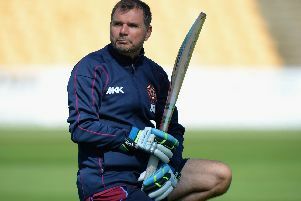 “The disappointment at going out of a big tournament often signals the end for some players,” Northamptonshire’s director of cricket David Ripley said. “It means the selectors will start looking for people they can invest time in so they are ready come the next World Cup or big Twenty20 competition. “David would certainly be a stand-out candidate. “He’s dynamic and a three-dimensional cricketer in that he can bat, bowl and is a fine fielder. The one thing that has held Willey back so far in his career is injury. Various niggles have hindered his progress at both county and international level with a stress fracture of the back forcing him out of the England Performance Programme in the winter of 2013. His recovery from that also limited him to a mere nine first-class and six List A matches last summer. But after surgery, recuperation and then some hard training during the off-season he is ready to go for this summer. “He’s fit and firing,” Ripley explained. “He’s a good winter he really looks in good shape. “After the operation his back has settled down and he has very worked hard. “The thing with David is that he is ‘Mr Action Man’ and always will be. “Obviously he can’t do that for every day of the season, though.